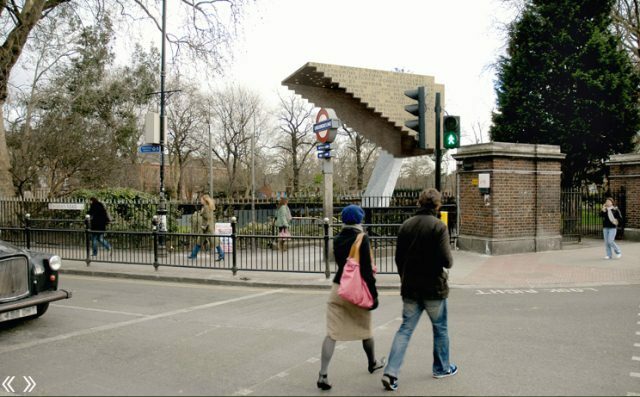 After a campaign lasting many years, work to build a permanent memorial to the 173 people who died at Bethnal Green station in 1943 is underway. The worst civilian tragedy of the Second World War happened when a new type of anti-aircraft gun stationed in Victoria Park was tested on the night of 3 March, 1943. The unfamiliar sound, and the sight of searchlights strafing the dark skies, prompted a panicked crowd to rush down the station steps. One person tripped and fell, causing others to lose their footing, and within seconds there was a crush,. Scores were asphyxiated, among them 62 were children. Campaigners have long argued that the victims have never been properly honoured, and a temporary monument has sat at the station's south-eastern entrance for years. The long-awaited permanent memorial is now going ahead. Called Stairway to Heaven, and designed by Arboreal Architecture, it takes the form of a hollowed-out model of the steps, with 173 holes placed in the roof to mark each life that was lost. The monument should be completed within two month. Money has been raised for all but the staircase element of the memorial, with an additional £60,000 needed to complete it. Follow the progress, and find out more about the campaign, at the Stairway to Heaven Memorial website.